I've got some good news! I'm going a nice (and very fun) 8kts. Don't start worrying, since I'm still north of the equator I won't have to give up on the non-stop attempt. I will be re-staring from Cabo as soon as I can. We have all been discussing this for awhile now. I've spent the last week talking with my team, testing things and doing whatever I could to make this work. The fact is I am just not able to generate enough power with my solar panels and wind generators to keep up with all of my energy needs. We didn't budget enough fuel for me to run my two alternators as often as I have been needing to so....A new battery or two and more fuel will be put on board in Cabo. Also, the trouble with the wind speed gauge seems to be in the wiring in the mast. I have tested everything else so that needs to be fixed as well. I was really upset about having to stop. I've hardly even started and I'm already heading in! I had finally gotten settled in, things were going somewhat smoothly and I was having fun. But I am glad that my team will be there waiting when I get in and I'll be back out here soon, hopefully with a few less problems. You'll all be happy to hear that I actually have been sleeping in my bed the past two nights, and that my sleeping patterns are much improved since a few days ago. Though I am headed towards shore, which takes a bit of fun out of things, its not at all bad. I'm racing along close hauled and slamming into everything with the waves splashing up over almost the whole boat! I'm not sure it gets any better then this! Today I found another pen as well as a fork and a knife! It really made my day which is a good example of the simple pleasures of life on board Wild Eyes! 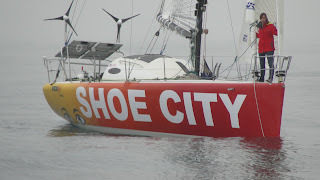 Things have been going pretty well, I had a good 24 hour day of around 12 knots... I'm just guessing how much wind there was because I don't have my wind data back yet, but we were moving along quite nicely. Today my wind is gone... not only that but there is no sun either, and my batteries are quickly draining, so it looks like I'll be up hand steering pretty soon. Being able to get email through my Thrane & Thrane Sailor 250 has been great! Since I don't have the bulk of my phone minutes sponsored, email has been my main means of communication with people other than my family. Its been great being able to hear from friends, and being able to talk to my team about anything. Its been about three or four days since I've seen any ships, or any boats at all for that matter, and I was able to get some good sleep last night. I haven't gotten any more squid on deck recently. It was becoming part of my morning routine to go and toss them back in the water! I'm really hoping to get into the tradewinds soon. It has been awful how slow I'm going! I'm pretty much dead in the water right now with the sails just flopping around. A lot of people have been asking about what I am eating out here. For the first few days I didn't eat much of anything. My stomach just couldn't handle it. Now I have been eating some of my fresh food packed for my first week before I get into my mostly dehydrated food from Mountain House. Before we got any food we worked with a dietician named Kristy Morrell who works in her own business and also as the dietician for the sports program at USC. We talked for a long time about what my nutritional needs would be and how to get all of them in the different conditions I would be living under. I ended up with quite a bit of dehydrated food because I had to be careful about not weighing down Wild Eyes too much. I have a lot of power foods for snacks like dried fruit, nuts, bars and beef jerky. My mom was really good about packing a bit of chocolate for each week's food bag. For breakfast I have a choice of oatmeal or granola with milk (powdered) and dried fruit or dehydrated eggs which are actually really good. Lately I have only been eating one big meal a day and snacking the rest of the day. There isn't a whole lot for me to do right now. I'm actually thinking of pulling out my school books... its kind of a nasty thought, but I guess it has to be done sooner or later! It's been a good day so far. I'm not sure how much wind I've got, my gauges have gone and decided to stop working! But I am making good speed and having lots of fun! I'm surfing down these big swells going 7 knots! Once Wild Eyes gets going she is a lot of fun, and the conditions today are perfect! Hopefully I'll be able to make up for some lost time today. I had a visitor yesterday afternoon. I walked into the cockpit and there was a squid there looking up at me! I tossed him back into the water, but I keep finding more! They're all over my boat! I never heard of a flying squid. So far I haven't seemed to have left anything too important behind. I only have one pen on the whole boat as the team was using them while they were on board and you know how it goes with pens. I also have only one spoon but other than that I think everything made it on board! My long hours of being awake are starting to catch up with me. I just crashed out for about an hour this morning. It looks like I'll have some steady wind today so I'll hopefully get some extra time to sleep today. I spend most of my time either outside in the cockpit or down below at my chart desk. I haven't actually pulled down my bed yet, I usually sleep right here at the desk. I feel a little safer being right by the radar and all my other gauges, and my big seat here is really just as comfortable as the bed! BTW, for anyone who saw my nav station on Facebook, the red button switches the display on my wind intruments. The seat at the nav station is a half circle and really a tight fit. I wedge myself in there with a few pillows and stuft animals from AquaFriends and it is really comfy. I've been keeping close tabs on my power usage which seems to have a few communication problems. Team Abby is working hard to help me figure it all out. I have to go and trouble shoot the wind instruments. I'll get to your quetions in tomorrow's blog. I wish I could have written sooner, but as most of you probably know, the first few days out are pretty hard. 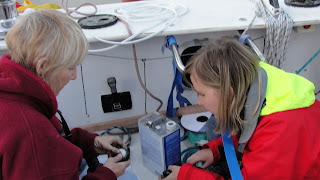 It isn't just having to get used to being in the middle of the ocean alone but also trying to troubleshoot all the little problems and figure out power consumption and all that. So far things have gone well. There hasn't been much wind during the day, and I've been getting a few hours of 15 -20 kt winds in the afternoon. I think I've been out here three nights and so far I've found that I sleep just as much during the day as I do at night, just napping here and there. I'm pretty far off shore so I haven't had a lot of shipping or any other boats. But even without that, keeping the boat up requires being up at all hours of the night. I really need to start working harder at sleeping, the long hours of no sleep are beginning to catch up with me and I'm feeling pretty tired. I'm 15 miles off Guadalupe Island and going about 3 knots. 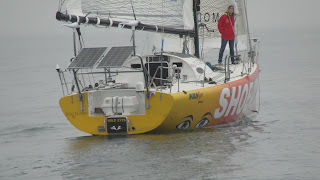 Not the best speed, but for there being only 4 knots of wind its not at all bad. Saturday morning was pretty crazy with people and press everywhere. I hardly remember any of it, it was all just a blur... I was told that that morning would all be a blur, and several people told me it would be like getting married. The wedding analogy didn't help me with what to expect a whole lot... but I guess I'll have some idea what a wedding is like! The first day was pretty hard, but things are getting better, I'm sorting out my charging and getting a handle on everything on board. Thanks for all of the comments and emails. I'll start answering your questions in my next blog. Abby didn't get to a blog today but we wanted to update you all that she is doing great settling in. She struggled with light winds all of last night and most of today but picked up about 12 knots around 3 pm and had made 24 miles in 3 hours. She has passed out of American waters and achieved her first small goal of getting south of Ensenada by Monday evening to avoid some storm activity that will be forming there. There is much to do with monitoring her power usage, assessing the accuracy of her radars and alarms, finding and restowing things. She was able to sleep some and eat some so Day 2 has been a good one. Thank you to Lisa Gizara for her fabulous photos! 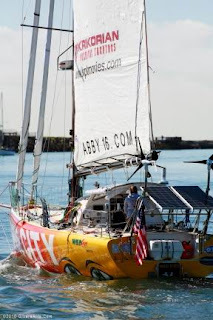 Just heard from Abby who is sailing in light winds down the coast and due to pass Catalina Island this evening before heading due south. She was a bit annoyed at the light winds but knows that it was now or never. 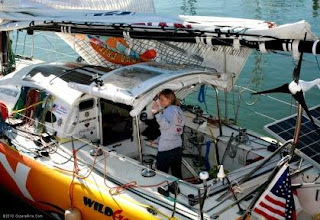 Her goal for this week will be to settle in to the boat and get as far south as possible as fast as possible. 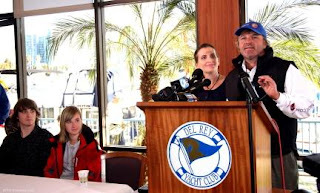 Thank you to the Del Rey Yacht Club, especially Sherry Barone, for hosting Abby's departure, to Nate N Al's Deli in Thousand Oaks for supplying abundant bagels and cream cheese and to Kauffman Sports and Susan Hartman from Magnetic Entertainment for coordinating the day. Laurence got pretty choked up when he tried to talk about Team Abby so that it was hard to get a Thank You out. You all know who you are and you are in our thoughts this evening as Abby benefits from your dedication and expertise. 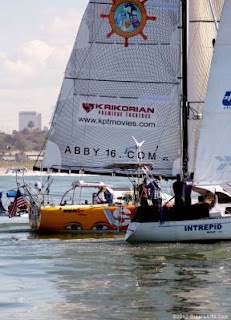 It was a clear, crisp day and Abby was surrounded by friends and family for a few miles as she sailed out of Santa Monica Bay. She was stowing and tweaking things and promised a blog, all being well, tomorrow. Good Morning America have been filming Abby's preparation and will air a segment tomorrow morning sometime between 6-8 am! I am told that it should be on the web as well. Thank you for all of the encouraging comments and emails. I know they mean a lot to Abby. 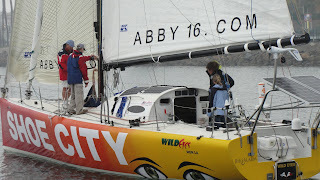 After years of dreaming and months of hard work, prayer and perseverance Abby's weather router has given the go ahead for Abby to depart on her round the world sail this Saturday. 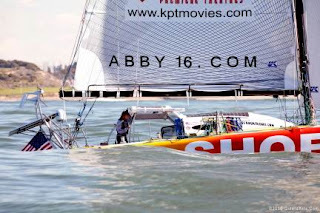 As many of you know Abby grew up sailing, traveling and having the freedom to pursue her dreams. 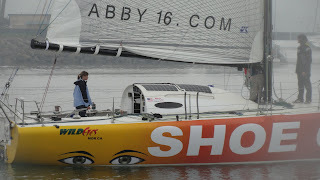 She has explored many passions in her 16 years but keeps coming back to sailing. 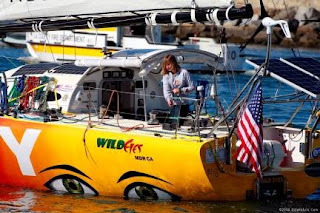 She gave up her horse, her position on the Mock Trial Team, her college classes and even her long hair and has thrown herself into learning every wire and button on her newly refit Open 40 sail boat Wild Eyes. None of this would be possible without the incredible support team, affectionately called Team Abby, here in Marina del Rey. 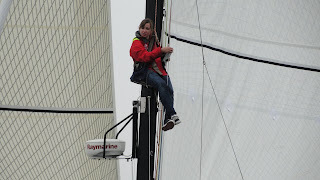 Headed up by her dad, Laurence, they have systematically put the best of the best onto an already incredible boat. Built for safe but fast single-handing in the Southern Ocean, she is equipped with 5 water tight bulkheads, an escape hatch and a self-righting system. She will be guided around the world by the professional meteorologists at Commander's Weather who have safely routed boats through the Southern Ocean for over 30 years. Sorry it has been so long since I last wrote. Life has been pretty crazy lately, crazy in a good way. I went out for another short sea trial. This time with Allen Blunt, the rigger, who needed to finish up tuning the rig. It was a beautiful night. We went out past Catalina Island and back. 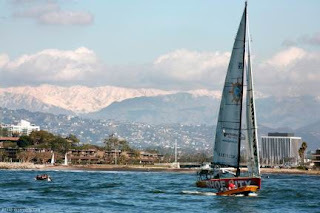 The thought of just keeping on going was very tempting, though after some thought I decided that Allen may not be all that happy if he woke up in the morning to find that we were nowhere near Marina del Rey! And so, we turned around a few miles past Catalina. The trial went pretty well, though we did find even more problems with the charging system. The bad weather this week has ended up to not be all bad, as Jerry Nash, and a new member of our team, Scott Lurie, are hard at work rewiring the whole charging system and I have a bit of a cold. I'm hoping to be well enough in the next day or two to get out in a few of these storms and see how every thing puts up in a bit of weather. 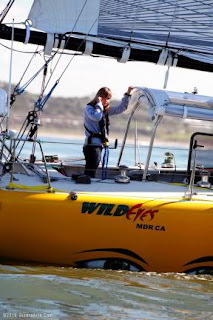 Wild Eyes handles so well in rough weather that I'm really looking forward to getting out there! I have been practicing using some of my equipment that I had never used before like the AIS ships radar and the Thrane & Thrane Sailor 250 that will allow me to check email and send photos and video. I have to be very careful about how many Megabytes I use as it an expensive peice of equipment to run. Thank you to Fleet Broadand provider GMPCS in Florida for sponsoring me a generous monthly allowance. I hope I can keep to it!! No web surfing for me! 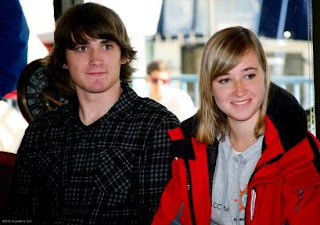 Congratulations to Jessica Watson on rounding Cape Horn! She's done an amazing job and I hope the rest of her trip goes as well as it has so far. I also recently heard that Laura Dekker is now being allowed to go on her trip. I wish her the best of luck, I don't know her personally but she seems like a great kid! Sixteen seems to be the age now for people to head out on their circumnavigations with Zac, Mike, Jesse, and myself. I'm very impressed by Laura Dekker and the guts she must have to face her critics. I can only imagine how bad it has been for Laura being as young as she is. It sounds like she'll be having the time of her life, two years of cruising around the world. Laura, Jesse good on ya both! I wanted to thank Nate N Al's Deli in Thousand Oaks for hosting a small dinner party for my team. It was a lot of fun to get together and have a little time to relax and talk and the food was great! As it is an El Nino year, we are having a lot of interesting weather. There are a series of cold fronts coming up the California coast this week in quick succession which means I will have to wait until late Friday or early Saturday to make some serious southward progress. Even then, it will be a rough few weeks with more systems predicted to form. We will be sure to let you all know as soon as the time, date and place are confirmed. Well, better get back to getting over this cold! Abby is out for the night testing sytems on Wild Eyes but we wanted to update everyone as to potential departure dates. It appears that the autopilots are working fine, the charging systems checked out and the dodger was installed today. She is ready to leave Monday but the forecast is for several cold fronts to blow in from the south (which would be directly on the nose). The high winds and building seas would make it pointless to head out and bash for 4-5 days though we are on the lookout for any change to today's forecast and if a window appears - we will let you know! Thank you for all of your comments and emails. Abby is pretty busy these days but hopes to get back to you more once underway. I left Tuesday afternoon with the rigger, electrician, and camera man on board. It was really a great day out, except for there being hardly any wind. We calibrated the autopilots, I went up the mast and got some good work done. After about an hour of working on the rig and some of the electrical stuff, everybody hopped off of Wild Eyes, and I was off for a good sea trial alone! It was so nice to finally get out there alone! 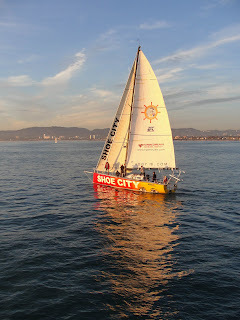 I was headed down to Malibu going a good 5-6 knots in the light wind. There was supposed to be a bit of a blow coming in around 3 in the morning, so I was really looking forward to that. The wind was picking up nicely, so after a few hours, when it was starting to get dark I tacked out towards Santa Barbara Island. The wind picked up to about 12 knots so I put the first reef in the main, so I wouldn't have to once it was completely dark thinking that if the wind didn't pick up I could always shake it out. The night went smoothly. The boat was so loud with both of the wind generators going! It is the kind of noise that you're happy to hear though because it will be what keeps the batteries up enough to run the radar and autopilot during the night. After I had set up the alarms and made sure that everything was working I was planning on getting a little sleep, but with all the excitement, I wasn't able to! Anyway, there was so much I could do and why waste time sleeping? I would have plenty of time for that later. The radar got a good work out as I went through the shipping lanes twice during the night. I went out a few miles past Santa Barbara Island then tacked back in around 12:30am. I had been excitedly waiting for the wind and waves to pick up a little... but instead they died down. The wind picked up and died down for a about an hour, giving me a good work out reefing and pulling up the sail a few times. By about three the wind had died almost completely and the autopilot was acting up so I was at the helm going a very depressing 2 knots. I had a few dolphins following me which was fun. You could see the glowing streams where they were swimming because of the phosphorescence. It was really amazing and just added to the fun and excitement of the night. 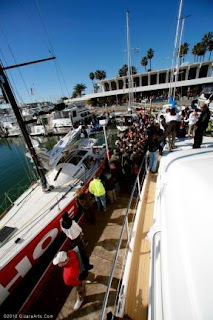 I got back in to Marina del Rey around 10:00am and pulled into my slip where two news crews were waiting. Noone had been expecting them and having been up all night long I was in no mood to humor the media, but at least they were quick and stayed out of the way. We are looking into why the autopilot went out and also why the alternators weren't charging the batteries. So it looks like I wont get out by Saturday which is not that bad because there wasn't going to be any wind anyway. Well I have to run, tons to do at home here! Just a quick note about the difference between an Open and a Class 40. They are generally quite similar. 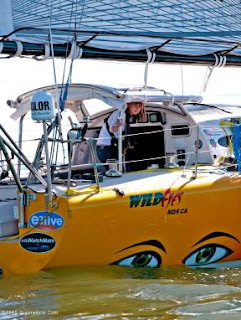 In Wild Eyes' case, she has a much more narrow beam and she is a Category 0, she will self right if she capsizes as long as the keel hasn't broken and she also has five water tight compartments. If she ever started to take on water I would be safe inside the cabin until I could find out what was wrong. Today's sea trial went well. Sea trials being meant to find problems... we found ourselves a few. Nothing too big or bad but now we have a few extra things to add to our list. We'll do a bit of work tomorrow and hopefully get out again, this time with the rigger. If that all goes well, I'll head out in the afternoon for a day or two alone, just to test things out. If that all goes well, I will be leaving on Saturday. Here are a few pictures of today's sea trial, not to brag or any thing... but I'm quite sure I have one of the most amazing boats ever! And she really looks good in the pictures! Its been a good couple of days. The dodger frame is finished, the boom is on with the rack and lazy jacks, the staysail is on, and the main and jib will get put on this morning. After that we'll head out for a little bay sail to check on things. Mark from Maritime Communications has spent the past few days in the very back of my boat (not the most comfortable place) working on hooking up the auto pilots, but today once things were ready to go, they weren't working right, so there is a bit more work to be done there. 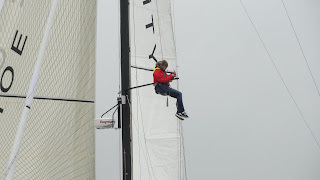 I pulled myself up the mast twice today, and it was a lot easier then I thought it would be! Of course I was in the slip and it will be harder once I'm out there, but I'm glad I got a little practice today. The dodger is going to be great to have. Anyone who has sailed on an Open boat will probably understand how open the cockpit is. In bad conditions it can be really miserable to be standing up there at the helm. Its probably hard to imagine a dodger on a boat like Wild Eyes, but it is possible and if it works out how we've planned it will be great. If all goes well with the test sail with the riggers today, I will set off on my test sail tomorrow and leave at the end of the week. I'll be sure to let you know the date! I meant it only as I am not the best at installing watermakers, auto pilots and running complex wiring... and packing for this trip is something that does need to be done carefully. I have spent many days annoying the electricians with my questions and having them carefully explain their installations. As for whether or not I'm rushing, I answered that in an older blog and I'm not doing it again. We are working hard, fast and carefully. Any way, I really do enjoy reading all of your comments and I have to say it makes me really happy to see those of you who support Jesse and I both! 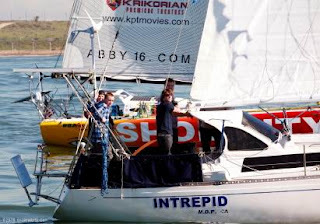 Yesterday afternoon another sponsor hopped on board, so after the meeting we got in the car and headed off to San Diego for the main sail to have a new logo put on it. While we were there we also met with Stephen Mann. He is an amazing guy who got back last year from a trip around the world with the same route as me. 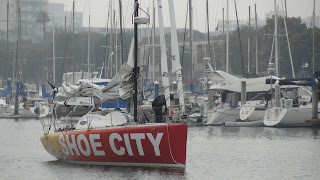 He made it around in 8 months, spending two months at different stops and six months sailing. His boat is a lot like mine (on the outside at least) and so it was good to talk to him about his trip. He had a lot of useful tips - things like keeping out a small drogue. He said he played around with different sizes and that a very small one took a lot of stress off the autopilot and didn't slow the boat down at all. Steven is really an amazing guy, of course he's an adult so he didn't get a load a criticism about his trip but he's one of those people that definitely has his head on straight. He said that of course it is going to be hard, and being a girl and not as strong as him or my brother, it will be even harder. But strength isn't something impossible to work around. Things are harder and may take longer and that's the end of the strength issue. Steven is one of those people that look on life as an adventure. No matter the situation it is really what you make of it - whether you're going through an ordeal or having an adventure. It's the same with every thing in life, its all how you look at it and what you choose to make of it. Your attitude is the one thing you can always control. He helped me remember why I'm doing this. It has been my dream, a goal I have been working towards for years. As far as the technical advice, we appreciate that too. We do have a very qualified team. 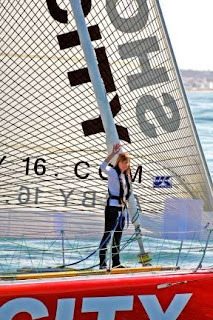 Since we are waiting a few days for the main sail, my dad may knock up a hard dodger similar to Zac's while we're waiting as that would definitely be a good thing. 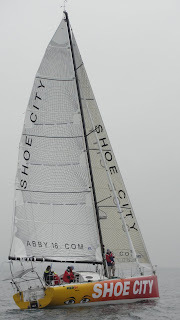 I'm off to the boat for some instruction in my new autopilots, and the incredible Thrane & Thrane Sailor 250 system. I stayed at home today to help out with packing food and a few other losse ends. I'm not much help with all the work that's being done on the boat right now, and its good to be home for a day every now and then. Thanks to Good Morning America, who wanted to get some footage of me hanging out with friends, I got to get together with some friends that I haven't seen in awhile last week. Packing food has turned out to be a bit more difficult than we had thought it would be. My mom has been working hard at it for the past three days and it's just about done. We'll get it all down to the boat tomorrow, and hopefully there will be enough room!! I ended up getting an Amazon Kindle, with a waterproof case. It seems great! I can download books in the car on the way to the marina and back everyday. I've got about 30 books on it already, but just in case, I'll bring a few of my books from home. Steven Gloor from Vesper Marine in San DIego came up on Sunday to show me all the ins and outs of my new AIS ships radar and transponder. Unlike during Zac's trip, my AIS will actually transmit a signal as well so ships will be able to 'see' me as well. My diesel heater was condemned over the weekend after many hours spent trying to fix it. After hearing about how cold Jesse Watson is today, I am glad that I will have a new one - not that that always means it will keep working! Lots going on down in the marina. I have to run but will post photos and blog tonight. Happy New Year to everyone! !